A Vegas Girl at Heart: Going Digital? I have been pondering for awhile how I want to approach 2014. I'm finding myself a little overwhelmed with keeping up with a weekly approach, so I was considering not making rules for myself next year and just making pages for whatever period of time I wanted. So I've been sitting on that idea for a couple of months, and today, the idea of going digital popped into my head. I've been watching Cathy Zielske's transition to digital during the year, and I love how simple her style is. But my dilemma is, I have a LOT of physical supplies. I even bought 2 years worth of Design A protectors when M's had a buy one/get one free sale. Some of these supplies I can use for traditional scrapbooking. Some I could sell or give away. The more I thought about it, the more I because excited with the idea of going to a digital Project Life format. 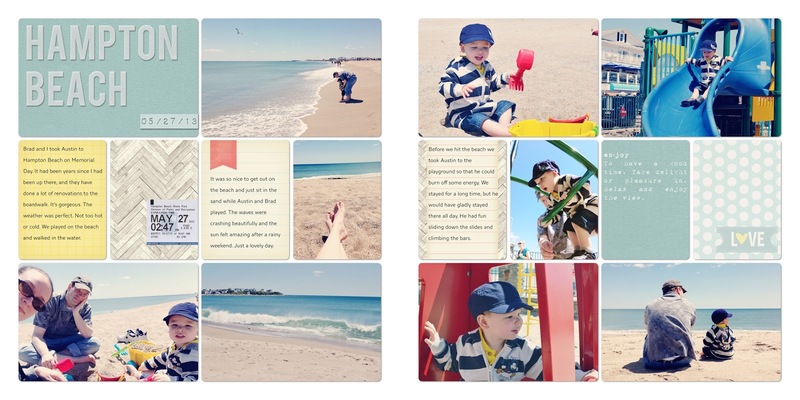 I love the idea of creating layouts in Photoshop. No printing, no cutting and pasting. No worrying about what embellishment fits where, what I have to match this kit or that kit. And the freedom to use a lot more digital products. I thought about printing a photo book of the layouts at the end of the year (or end of whatever period of time). 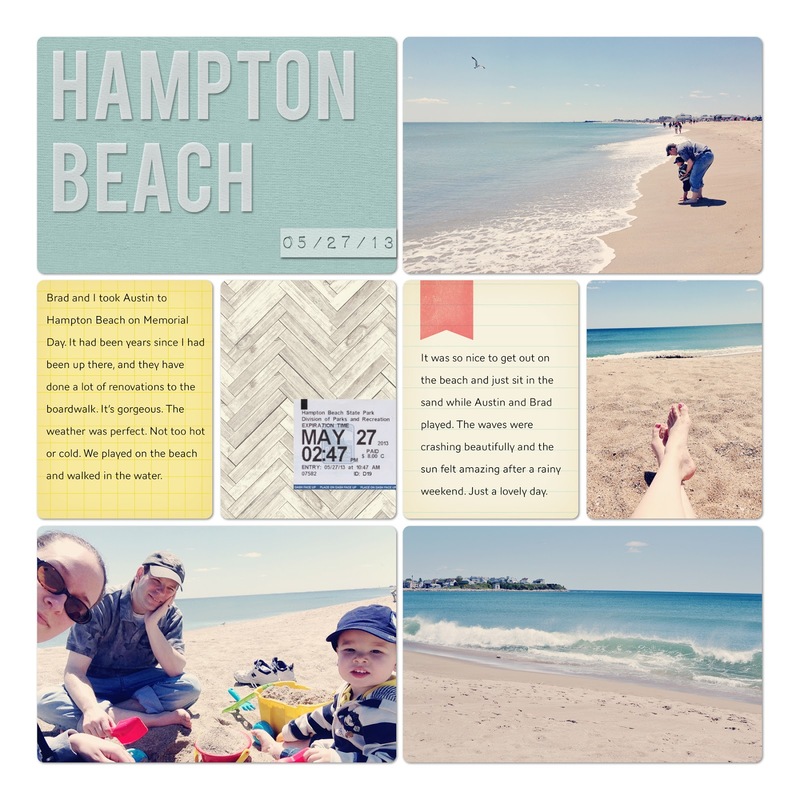 So tonight, I bought Cathy's templates (I like the subtle rounded corner & shadow on hers) and went to work, using some photos from a beach trip that I had previously documented in physical form. I used some vellum layer styles from Mommyish and made vellum "thickers" for the title card (which is from one of my textured card stock sets). I even added the parking ticket. (I would scan this type of stuff going forward but for this test I just cropped it from the photo of my original spread). On the right page, I used a freebie from American Crafts (it was around Valentine's Day, you got the set free when you made a purchase with their digital store). I recolored it to match the layout and then used one of the vellum layer styles again to make it look like a vellum 3x4 "card." On the textured card stock, I added one of my own freebie brushes. I absolutely loved putting this together. 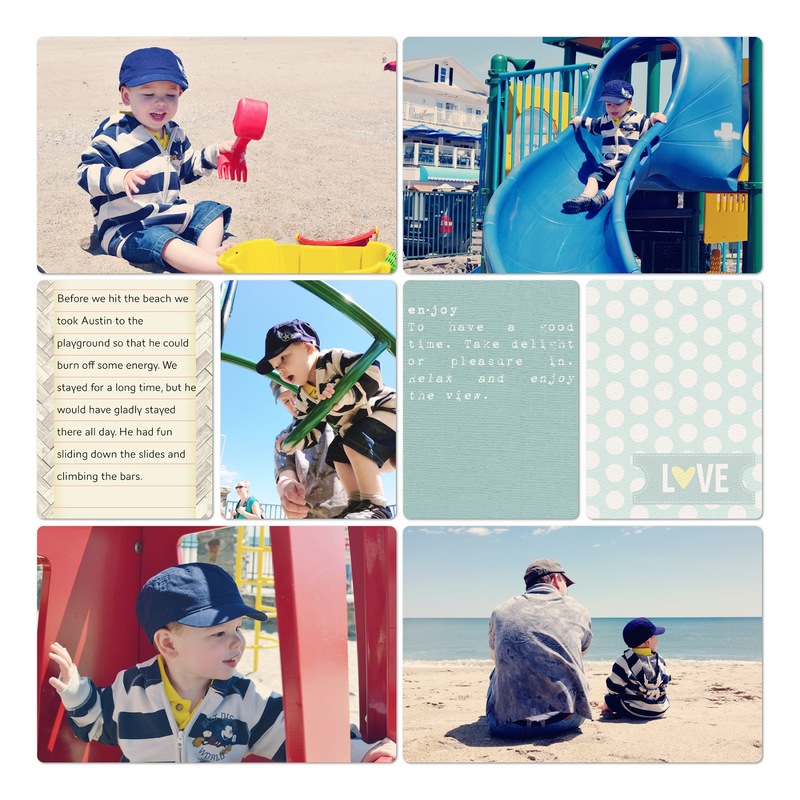 The templates make it really easy to add in photos and cards. Once I spend a little time organizing my digital brushes & overlays, I'll be able to find what I want to use easily. I'm keeping my background white. I really like the look of a simple white background, like in this book by Tracy Larsen. I think it'll make such a nice photo book. So that's what's new right now. Looking forward to 2014! In other news - I made a few new brush/overlay sets the other night that I'm hoping to get up for you guys later this week. I think you'll love digital! I know I have. I love that I can sit in the living room with my family and scrap. I have a random request/question: With your digital items, are you going to add something at the front to label you as the designer? I manually add VGH so I can give you proper credit, but I didn't know that the enjoy brush was yours. I couldn't remember where I got it! I look forward to seeing more from you. I never thought of that. You mean like, include a copyright brush in the file too? I suppose I could, it just didn't really occur to me to do so. The copyright is up to you. What I meant was when I buy digital supplies there's always initials at the beginning of the files indicating who it belongs to (ep-echo park; bh-becky higgins; swl-scrapping with liz;etc.) it makes it easy for me to give credit when I share my layout online. Just like you list your supplies used on your paper layouts. The problem is of I forget to label it when I unzip, I end up unsure who created it. This layout helped me know where I got the texture cards from. Ahhhh, ok, I see what you're saying. I can do that going forward! It would be tough to go rename all the ones I've already posted, but that makes perfect sense. Thank you for the tip! :) I'd previously downloaded some brush files and they have included a brush with the creator's copyright, that's what I thought you meant. I'd much rather name the file with my initials. Thank you again! I have struggled with the same thing. I love the idea of digital, especially because the album would take up so much less space. I just don't know how to tackle all the memorabilia that can't be easily scanned (like brochures, cards, etc). Right now, I include a big envelope page at the back of my PL album to hold extras that I don't slip into inserts. I noticed that you can have the shutterfly albums printed with a pocket. I was thinking that I'd scan most of the memorabilia and if I wanted to keep some of the physical stuff, just stick it in one of those pockets. Not sure yet. I think this will be a learning process, to see what I like. I scan any memorabilia with my phone app. I haven't had a problem scanning anything yet, playbills, tickets, cards, etc. I have kept a few things like the card with my son's handprint in it. And I still scanned it, and put it in the book. But, overall, I've kept hardly any physical items. I've found, for me personally, that seeing the (scanned) ticket in my book, or the playbill gives me the same enjoyment that the physical item did. I used to keep every little piece of paper that came through our lives. And then, I was going back and finishing 2004, and 2005 scrapbooks. I realized that while I wanted the memory, I didn't need the item. It was a little eyeopening to me. As was hearing Becky Higgins statement about we can't be everyone else's memory keepers. In fact, we are really just telling things from our perspective, so we aren't truly our children's memory keepers either. (paraphrasing). This is a really good point of view, Courtney. I just know I wish my mom had done scrapbooks like this/saved certain things from when I was little so I could have them now. She does have photos and some albums and stuff, but it's all disorganized. I'm not even sure what she's saved, to be honest. She does save stuff, more than I do, I'm sure, but there's no real organization to it, it's all up in her attic, and so on, so I don't have that in my hands. If she had scrapbooks like these, they might be more accessible. I think that's why I'm so obsessed now with keeping/documenting everything. I went digi with my PL two years ago and I LOVE it. I love traditional scrapbooking but I just found that I do not have the space or the time to drag everything out and work on it as often as I'd like. I'm far more effective when I can grab the laptop and work on it whenever I want. With that being said - I would not recommend getting rid of your traditional scrapbooking or PL supplies. You will find from time to time that you want to pull out the paper trimmers, the adhesive, and all those pretty embies!! You will love digi but you will also come to miss getting your hands dirty. You know, so I'm finishing up Tycho's album and I'm kind of dying, with all the cutting and trimming and printing and pasting. Making sure photos go in the right month, what if I drop a set of photos (oh god they're out of order!! ), what do I do with all these stickers or embellishments in a pack that I don't want. Plus, all my scrapbooking stuff is in the basement, which makes me sad as I can't work on it all on the main level like I want to. I hope it's okay to say this, I love Melissa's tutorials. I also found this tutorial by Jessica Sprague was great for me: http://www.youtube.com/watch?v=lAQ8y8Pq95k She doesn't sell the digital project life anymore, American Crafts does. As a sidenote, I had opened PSE once before. Then I decided that I would do Project Life, and digitally. I watched the video, and started reading the tutorials, including Melissa's. I have successfully completed 49 weeks of PL now. Try it. PL is super easy in PSE. Perfect! I'm so stoked. I'm sure Matt will be happy, too, for me to consolidate my paper and other crafts even that much more, haha. Thanks, Courtney! I'll be sure to check out Jessica's tutorials and American Crafts as well!